I promise to use it only to send you On-Site Waste-Water Advisor. Carl's Septic Service, Inc. is honored to be featured in the North Wheatland Township Homeowners Directory. We have been providing septic pumping and complete septic system services to Will, DuPage, Cook, Kane and Kendall Counties since 1962. We design and install replacement septic systems. We can locate your septic leach field lines and septic tank. We Conduct well and septic inspections for real estate transactions. We provide complete septic service From Concept . . . To Completion. What kind of septic system do I have? Nearly all of the septic systems in North Wheatland Township are conventional septic systems. Your septic system will have a concrete septic tank and a septic leach field consisting of 36" wide gravel trenches with a 4" diameter clay tile in the middle of the trench. The number of trenches and the total lineal footage of trench will vary by the number of bedrooms in the residence and soil category used to size the septic field. After 1979 most septic trenches were constructed using 4" plastic septic tile not clay tile. Fifteen years ago septic contractors began using septic chamber sections instead of gravel and tile. A common septic chamber system that is used is the EQ-36 by Infiltrator. Why the switch to chamber? The chamber system can hold approximately 40% more effluent per lineal foot of trench than a gravel trench that is 36" wide. Trench spacing can be 7' apart on center instead of 9' which allows for more absorption trench to be installed in a smaller area. And it is less labor intensive to install. Do you know what size septic tank that you have? 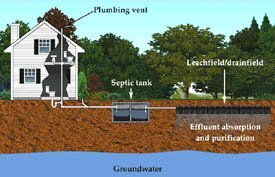 The size of the septic tank is determined by the number of bedrooms in the residence and defined in the state of Illinois Private Sewage Disposal Code. Why is it connected to the number of bedrooms? The number of bedrooms has been used as an indicator of the potential daily sewage flow from a residence. It is based on the assumption that there will be two occupants per bedroom generating 200 gallons per day per bedroom. The minimum septic tank size is 1.5 times the estimated daily flow. Homes that where originally designed and permitted with a garbage disposal or grinder will have a tank that is 50% larger than the minimum required size. 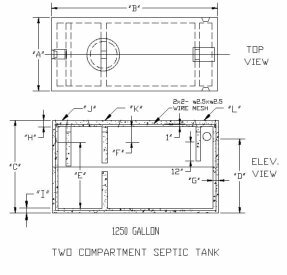 Here is a list of minimum septic tank sizes. Some homes in the subdivisions of North Wheatland Township have two compartment septic tanks. This is important to know when you have you have your septic tank pumped. In order to properly clean a two compartment tank the service technician needs to dig open the access cap over the inlet and the outlet pipes. Some tank manufacturers cast an access cap into the center of the tank which allows both compartments to be pumped from this one opening. Because this page is for the home owners in North Wheatland Township I tried to provide you with information that is specific to your neighborhoods. Do you have a question about your how your septic tank works or are you experiencing a problem with your septic field? Give us a call at 630-739-1495. Or go to the Contact Us page and send us an email We are here to assist you in any way that we can. Let us put our knowledge and years of experience to work for you. The purpose of this website is to provide you with useful information about how your septic tank and septic system works. Information that will help you understand what needs to be maintained and why it it needs to be maintained. A properly maintained septic system protects our groundwater from contamination and adds to the value of your property. In addition to the information here, we publish a quarterly newsletter with helpful tips and advice about maintaining your septic system and new on site waste water technologies. Subscribe to the "On-Site Waste Water Advisor" . It's FREE.